973: Realizing the Perks - Twokinds - 15 Years on the Net! Keith: (in Keidran) So, that other you, is she… still in there? Youngtani: Tell Keith he’s cute. Natani: (in Keidran) Well, like I said, mind’s still fractured. Natani: (in Keidran) Still, it actually feels pretty freeing. Ya know, having a guy’s mind and being stuck in a girl’s body isn’t the worst thing in the world… It’s certainly not the worst body to be saddled with. Natani: (in Keidran) I mean… you like it, don’t you♥? Natani: (in Keidran) You aughta see the look on your face! You’re so easily frustered. I should have taken advantage of this ages ago! Keith: (in Keidran) Hey, shut up! Don’t ever do that girly voice again! It’s weird coming from you! 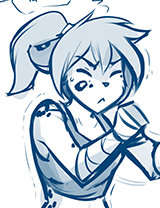 Natani: (in Keidran) Haha… Oh man. Natani: (in Keidran) Wanna touch ‘em?